Bringing the good news of Jesus Christ to the people of Colchester and the surrounding area, in the style adopted by the Methodist Church. 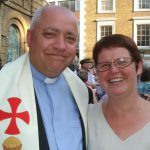 On September 1st 2016, Rev’d Steve Swann will be joining Alan and Ken as a Minister in Colchester Methodist Circuit. With his wife Julie, he is leaving a circuit at the very tip of Cornwall. Living in Stanway, Steve will be focussing his ministry developing the church presence in the West Colchester area.